← When Do Ideas Happen? Laughing out loud. 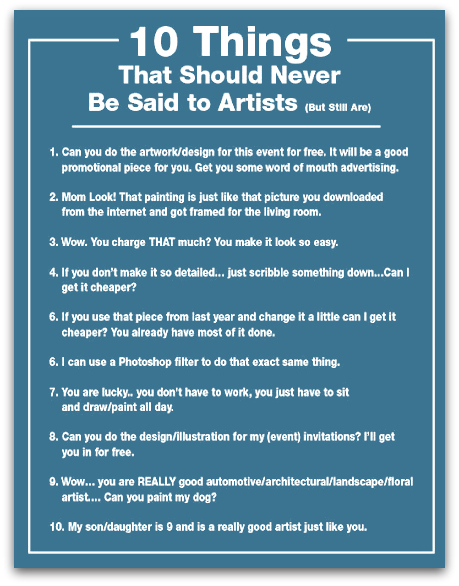 A pet peeve of mine is that people always ask artists to donate their work, artists generally pay to display their work, most artists (97% or so) work outside their art for dollars, making little from the sale of their art. Go ask your dentist or your mechanic to donate their work for your auction/ event and see what they say! “Exposure” is something people die of! 1, 3, 7, 8, and 10 totally apply to musicians as well! This gave me a good laugh and eye-rolling!